Old Brodleians retained the Fred Scott Memorial Trophy in good style with a 27-12 home win over Cleckheaton yesterday. They always looked the more likely winners of the traditional Boxing Day morning game, four tries in the final quarter doing the trick after they had trailed 7-5. Both teams had only a sprinkling of first team players for a game played out in bright sunshine and a cold, gusting wind. The fixture is hosted alternately between the rival clubs and is always a money-spinner with the bar doing a roaring trade. The Woodhead ground filled steadily yesterday to give what is likely to be the best attendance of the season. Cleckheaton, surprisingly beaten by the lower-standing Brods when the fixture was last played two years ago, had first use of the slope. They met stern resistance from a Brods outfit who absorbed early pressure and then drew first blood after local referee Hanson Haigh had sent a visiting forward to the sin-bin. Pocket battleship Michael Briggs looked the most dangerous back throughout and his second strong run in quick succession took him over the line 10 metres to the left of the posts for an unconverted try on 15 minutes. Cleckheaton were quick to respond. Brods were penalised four times in rapid succession and prop Ben Thrower rumbled over at the side of the posts for a converted try on 19 minutes. The score remained unchanged up to half time with the mob-handed Brods making good use of their rolling substitutes and matching their visitors at the set piece. All the play was in or around the Cleckheaton 22 after the break. A two-man overlap was spurned, Briggs continued to cut through and Brods were held up over the try line. Eventually the Cleckheaton defence was breached and simple passing did the trick in the end, Zak McComb crossing and Tom Breakwell converting to give Brods a 12-7 lead. Briggs stole the ball and his kick ahead set up the next try for Tom Wilson wide out. Cleckheaton were in no mood to lie down and Matt Wood went over in the corner following a penalty to touch, making it 17-12. However, Brods finished with a flourish. 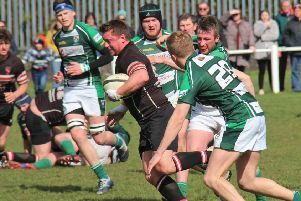 Andy Finn, one of their visiting former players, touched down following a Phil Town break and McComb sped in for his second try after Brods had broken from inside their own half.